The Best SAP blogs from thousands of top SAP blogs in our index using search and social metrics. Data will be refreshed once a week. Also check out Top SAP Youtube Channels list for Top videos on SAP. SAP newsletter is a comprehensive summary of the day's most important blog posts and news articles from the best SAP websites on the web, and delivered to your email inbox each morning. To subscribe, simply provide us with your email address. Global About Blog The Official SAP Blog. SAP is the world’s leading provider of business software offering applications and services that enable companies of all sizes and in more than 26 industries to become best-run businesses. Facebook fans 789,129. Twitter followers 213,243. Palo Alto, CA About Blog Official SAP account for the latest news, insight and conversations about #SAPHANA and in-memory innovation, including #Cloud, #BigData and #IoT. Facebook fans 25,997. Twitter followers 55,218. Global About Blog SAP official site for latest news and information from SAP, Press Releases and Newsroom, In-depth feature articles on business & technology trends,Blogs. Facebook fans 789,681. Twitter followers 98,013. About Blog This is the SAP Official YouTube Chanel. SAP is the world’s leading provider of business software offering applications and services that enable companies of all sizes and in more than 26 industries to become best-run businesses. Facebook fans 1,015,033. Twitter followers 242,014. About Blog A Reddit for all SAP discussions pro or con. Facebook fans 1,102,060. Twitter followers 482,886. Munich, Germany About Blog The Independent and Global Webzine Devoted to the International SAP Community - SAP Trends, Analyses, Strategies and in-depth Reports from Business and IT. Facebook fans 10. Twitter followers 229. About Blog The SAP HANA Academy provides free online video tutorials for the developers, consultants, partners, students and customers of SAP HANA. Topics range from practical how-to instructions on administration, data loading and modeling, and integration with other SAP solutions, to more conceptual projects to help build out new solutions using mobile applications or predictive analysis. Facebook fans 373. Twitter followers 1,577. About Blog Comprehensive up-to-date coverage for sap, aggregated from news sources all over the world by Google News. Facebook fans 22,933,188. Twitter followers 213,081. Sydney, Australia About Blog The Independent Magazine for SAP Professionals. Inside SAP delivers the ANZ SAP community a dedicated publication for strategies and techniques to help assist and maximise their company's investment in SAP. Facebook fans 1,268. Twitter followers 3,579. About Blog SAP Certification Sample Questions and Online Practice Exam for ERP, CRM, NetWeaver, BusinessObjects, HANA, SRM, Business One and Many Other SAP Solutions. Facebook fans 9,064. Twitter followers 750. About Blog SAPYard is all about SAP Technical Tips, Solutions and more. Facebook fans 1,029. Twitter followers 75. Plano, Texas About Blog Visual BI offers comprehensive, end-to-end BI services,including Real-Time BI, Self-Service BI, Mobile BI, and decision and Predictive Analytics. Facebook fans 1,084. Twitter followers 308. Irvine, CA About Blog Vision33 company blog focusing on everything SAP Business One for Small to Mid-sized Enterprises. Facebook fans 210. Twitter followers 1,313. SAP Recruitment - Europe About Blog Eursap’s SAP blog covering SAP news, information, developments and the latest SAP trends and hot SAP topics. Top SAP bloggers and SAP blogs. Facebook fans 8,528. Twitter followers 4,298. Paris About Blog This blog tracks innovation in analytics and social media, including topics such as big data, collaborative decision-making, and social analytics. Timo Elliott is an innovation evangelist and international conference speaker who has presented to business and IT audiences in over fifty countries around the world. Facebook fans n/a. Twitter followers 20,771. Palo Alto, California About Blog Analytics should set you free, not tie you down. SAP BusinessObjects delivers modern analytics for the digital enterprise that allow you to reimagine insights, collaboration, and your business. Whether on premise, in the cloud, or in the boardroom, SAP BusinessObjects is intuitive to use, easy to deploy, and results in better outcomes. Facebook fans 93,106. Twitter followers 64,665. About Blog Analytics should set you free, not tie you down. SAP Analytics delivers modern analytics for the digital enterprise that allow you to reimagine insights, collaboration, and your business. Whether on premise, in the cloud, or in the boardroom, SAP Analytics is intuitive to use, easy to deploy, and results in better outcomes. Facebook fans 97,392. Twitter followers n/a. Brookfield, WI About Blog The Symmetry blog highlights the latest news and insights from our industry experts. Thought leadership, SAP expertise, managed services advice and more. Facebook fans 667. Twitter followers 807. About Blog The UK & Ireland SAP User Group is an independent 'not for profit' organisation. Over the years they have grown and now comprise of over 500 organisations and 4,000 professionals. Their aims is to facilitate networking, knowledge exchange and best practice amongst SAP users. Facebook fans n/a. Twitter followers 5,033. Sunnyvale, CA About Blog FogLogic upgrades your enterprise applications to run with modern ops. Systems become reliable, with increased availability, and running error-free. Built for SAP BASIS enterprise applications. Automation, digital transformation, cloud migration, budget reduction and more. Facebook fans 328. Twitter followers 116. London, UK About Blog This blog is intended to be a collection of useful articles and other materials which can help you understand how SAP works and how you can work with it. Moscow About Blog SAP hybris under the hood: nothing is impossible. Challenges and opportunities, tips and tricks. Solution architecture notes from Rauf Aliev (EPAM hybris SA). Facebook fans 311. Twitter followers 371. About Blog Complete guide on SAP HANA certification along with HANA material, tutorial and self learning guide. Free interview questions and updates on SAP HANA. United States; Heidelberg, DE About Blog Datavard Blog shares SAP Tips & Tricks, Latest Innovations and Expert Interviews. Data management, information lifecycle management and system landscape optimization made easy by Datavard experts. Enjoy blog on latest SAP innovations. Facebook fans 390. Twitter followers 321. Hyderabad About Blog KBS Training Institue provides online trainings are SAP Modules, Microsoft Dynamics AX, CRM, NAV, GP, SL, C5, Oracle, BigData, Hadoop, Salesforce, SAS, Service Now, IT Management Training. Facebook fans 2,538. Twitter followers 2,171. United States About Blog SAP Database and Technology includes our SAP HANA in-memory platform for analytics and applications, as well as SAP Sybase ASE and IQ, SAP NetWeaver, SAP Information Management and other components of our technology portfolio. Facebook fans 68,524. Twitter followers 250,457. Palo Alto, California About Blog This blog is for Applications owners, database admins, Exchange admins, vSphere admins and application architects. Facebook fans 266,270. Twitter followers 256,692. Eindhoven, The Netherlands About Blog SAP BI consultant and author at Interdobs, working with the SAP BusinessObjects BI4 front-end tools and the SAP BW back-end. Specialized in SAP BusinessObjects Design Studio and Lumira. Facebook fans 603. Twitter followers 1,827. About Blog Read our blog to gain valuable insights and industry best practices from the SAP SuccessFactors and Retail experts at /N SPRO, a leading SAP partner. About Blog SAPSpot is intended to provide complete detail on SAP tutorial, interview questions, certification, available jobs and book. All information at one place. Facebook fans 69. Twitter followers 23. About Blog SAP-ADMIN.com is the best SAP Blog for all BASIS team member, here you can learn the BASIS, HANA, Solution Manager, S/4 HANA administration and SAP upgrades, SAP Migrations and much more. About Blog Syslink Xandria is the market leader in SAP System monitoring, management and analysis. Enterprise and managed service providers all over the world are using Xandira. Facebook fans 58. Twitter followers 483. Santa Clara, CA About Blog Stay up-to-date with content about SAP products and solutions. This Blog keeps updated as per the latest SAP trends and hot SAP topics. Facebook fans 185. Twitter followers 242. Palo Alto About Blog Approyo is a leading global SAP HANA technology solution provider. They make it simple for companies to implement big data solutions or today and the future. Facebook fans 49. Twitter followers 1,972. About Blog SAP ABAP is widely used in industry and it is booming of job opportunity.They serve SAP ABAP tutorial and material to help candidate to start with entry point. Facebook fans 62. Twitter followers 24. Santa Clara, CA About Blog Krypt is a global business that offers elevated SAP consulting services to all size of enterprises. Krypt products help to manage SAP investment and boost efficiency. Chicago, IL About Blog SAP Fieldglass provides the industry's leading cloud technology for services procurement and external workforce management. More than 500 global businesses leverage SAP Fieldglass' intuitive platform to gain visibility into its external labor, project-based services including Statements of Work (SOWs), independent contractors and additional flexible talent pools. Facebook fans 2,307. Twitter followers 3,464. MI About Blog This blog is on SAP Business One tips, tricks and case studies designed for users and prospective users. Global (HQ: Bangalore, India) About Blog Discuss business intelligence, integration, compliance and a host of other SAP-related topics – implementation, best practices and resources to negotiate the world of SAP better! Facebook fans 792,646. Twitter followers 222,443. About Blog SAPHub blog about SAP ABAP tutorial and SAP related articles. Facebook fans 2,459. Twitter followers 8. Palo Alto, CA About Blog The Startup Focus program encompasses 5579 startups in 25 industries across 58 countries, with 263 validated solutions available for SAP customers. Facebook fans 26,043. Twitter followers 7,564. About Blog SAP Docs Providing Best Resources for Your SAP Knowledge. Bangalore, India About Blog Learn SAP HANA and SQL even if you have no background in SAP. Read and interact with the author too. Come in for 100% free SAP HANA Tutorial. Facebook fans 71. Twitter followers 43. About Blog Get information about SAP ABAP,SAPUI5,SAP HANA,SAP Fiori,OData,SAP Netweaver Gateway,SAP Workflow,SAP Web IDE,SMP,SAP Mobile Tutorials,Interview Questions and more. About Blog Blue Ocean Systems Singapore implements and integrates customised SAP Business One and SAP HANA Solutions to help clients increase profitability and improve operational efficiencies. Facebook fans 586. Twitter followers 690. Tychy, Polska About Blog ABAP Blog shares Tips & Tricks for ABAP language. A blog founded by Łukasz Pęgiel in 2013 to provide code samples and ways of using ABAP hidden functions. Facebook fans 80. Twitter followers 246. Greater Pittsburgh Area About Blog IT Partner's mission is to deliver world class SAP consulting services. They achieve this by: - Delivering the right talent at the right cost - Mentoring on projects - Being fair and honest with their partners IT Partners fosters a workplace where: - People are treated fairly and with professional courtesy - Innovation and creativity are encouraged. Facebook fans 3,643. Twitter followers 4,273. About Blog This blog is designed for SAP Basis consultants for sharing knowledge tutorials and discussion of critical issue and Job opportunities to help each other. Netherlands About Blog Read this blogs about user experience and innovative SAP BI, Applications, Security & HANA solutions. Facebook fans 488. Twitter followers 792. England, United Kingdom About Blog Edenhouse Solutions' blog is designed to give you an insight into Edenhouse alongside expert SAP insight into your unique industry vertical. Facebook fans 158. Twitter followers 1,302. Seattle, WA About Blog Amazon Web Services (AWS) delivers a set of services that together form a reliable, scalable, and inexpensive computing platform “in the cloud”. Facebook fans 214,430. Twitter followers 1,289,790. Toronto About Blog This is TKReddy is a SAP Consultant by Profession, Blogger by Passion. He is experiencing SAP applications in extended supply chain as well as distribution processes. St. Louis, MO About Blog The EV Technologies team regularly posts articles on the industry's most up-to-date trends & technologies. Subscribe to our blog for expert SAP insights. Facebook fans 91. Twitter followers 657. About Blog The best learning blog for SAP, software engineering and software project management: ranked 38th most popular in the world. Facebook fans n/a. Twitter followers 232,895. India About Blog Ripples Info fetures articles and information on SAP HANA Modeling HA300 & HANA Admin HA200 Training. Facebook fans 2,149. Twitter followers 49. Facebook fans 381. Twitter followers 408. Singapore About Blog Axixis Consulting is a technology and management consulting firm providing cost-effective, leading edge business solutions based on SAP and Oracle software. Facebook fans 162. Twitter followers 85. Facebook fans 47. Twitter followers 371. About Blog SAP Business One services and support from MTC, a SAP certified reseller. Facebook fans 9,466. Twitter followers 4,917. Mumbai About Blog SAP expertise to the core Welcome to the leaders in global SAP recruitment Net Business Solutions (NBS) is SAP to the core. Because they are SAP consultants. Facebook fans 960. Twitter followers 205. Atlanta, GA About Blog SAP BI Blog is a community network sponsored by Decision First Technologies. The purpose of this blog site is to provide an unbiased source of information regarding SAP BusinessObjects and everything Business Intelligence. Facebook fans 249. Twitter followers 636. Australia About Blog Plaut IT Australia is one of the largest locally owned providers of on-premise and cloud SAP solutions in the ANZ region. It is the lighthouse partner for SAP’s cloud ERP, a software as a service solution based on SAP’s S4HANA digital core. Facebook fans 56. Twitter followers 64. Facebook fans 112. Twitter followers 69. Utrecht, The Netherlands About Blog This blog is everything about SAP's next big thing. Facebook fans 60. Twitter followers 4. TX About Blog SAPinsight is a member organization that provides learning, networking, and knowledge sharing for the SAP Super User Community, including forums, content, national conferences and regional events. Houston, Texas About Blog ASAP Talent Services recruits and hire SAP talent from the CIO level to team members in virtually every type of SAP/ERP skill set. They will shrink your recruiting cycle and ensure you have premium access to the non-active talent pool. Facebook fans 123. Twitter followers 348. 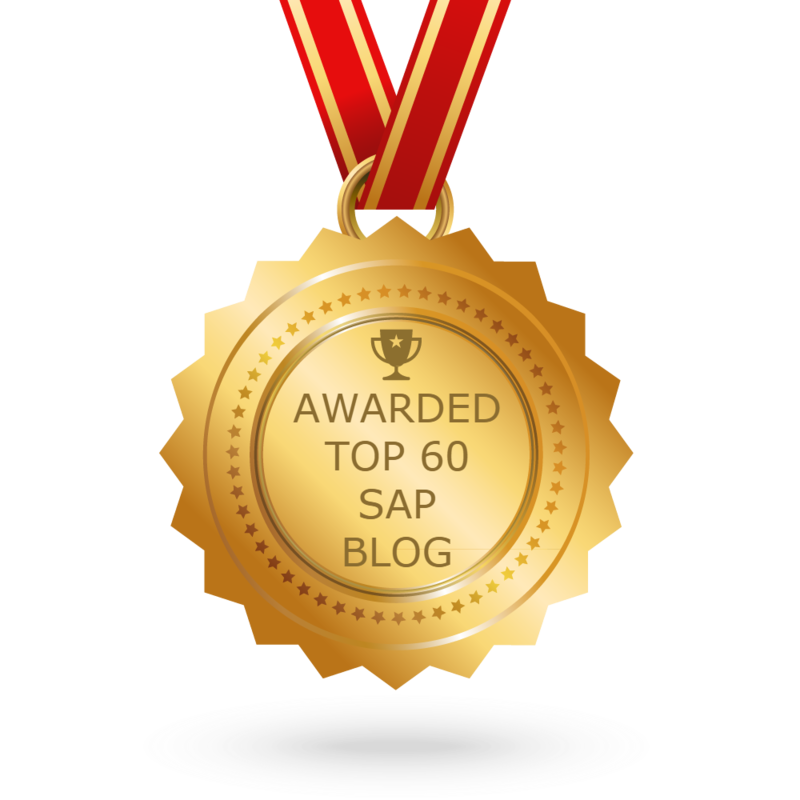 CONGRATULATIONS to every blogger that has made this Top SAP Blogs list! This is the most comprehensive list of best SAP blogs on the internet and I’m honoured to have you as part of this! I personally give you a high-five and want to thank you for your contribution to this world.